Discover Havana, a city full of history and music, and the cradle of the Cuban Revolution. Breathe in the atmosphere of the colonial era by strolling through the mythical squares and avenues of its old town. Be immersed in island culture in Trinidad. Enjoy the rest of your trip by relaxing on the beaches of Cayo Santa Maria on an All-Inclusive basis. International flights: UK - Havana - UK. Transfers in an air conditioned vehicle. Free cocktail in a popular bar in Trinidad. * The photographs of private houses in the section "Accommodation" are examples of rooms in which you stay, but they are not identical, as each private house is unique. Discover an authentic Cuban house that welcomes you during your stay in Havana & Trinidad. You will have a completely renovated room with air conditioning and private bathroom. IMPORTANT: ENTRY TO CUBA AS A TOURIST IS NOW NOT PERMITTED THROUGH THE USA. WHEN MAKING YOUR FLIGHT SELECTION, PLEASE ENSURE YOU DO NOT SELECT FLIGHTS WHICH CONNECT THROUGH THE USA. You will require a visa to enter Cuba. Please see https://www.cubavisa.uk/ for more information and to apply for your visa. Cuban visa (mandatory), vaccines, drinks, tips and any other services not mentioned in what's included. Arrival at your UK departure airport for your flight to Cuba. Arrive and transfer to your Casa Particular. Casas Particulares are private family accommodations in Cuba that can be compared to a boarding house or bed and breakfast accommodation. In contrast to hotels, you can get to know the true Cuban life. Rest of the day free at your leisure. Start strolling the streets of Havana and enjoy the vibrant atmosphere of the capital. Overnight at the Private House. Breakfast at the Private House. Enjoy a panoramic tour of Havana. Discover the most emblematic sites of Havana, including the old colonial centre, which was the cradle of the Cuban revolution. Malecón de la Havana, which includes a wide avenue with skyscrapers contrasting with the country's colonial history, is the dynamic and modern district of Havana. The highlights of this region are the Revolution Square and Central Park. Overnight at the Private House. Breakfast at the Private House. Free day. Let yourself be charmed by this colonial city, its cobbled lanes, carved balconies and pastel-coloured facades. We recommend trying a plato ropa vieja as well as the emblematic mojitos and daiquiris. Overnight in the Private House. Breakfast at the Private House. Drive to Cienfuegos for a panoramic visit to the only Cuban city founded by the French to see Central Park, Tomás Terry Theater and Valley Plaza. Lunch is served in a local restaurant. Before the onward journey to Trinidad starts, you can briefly explore the city on your own. Arrive in Trinidad and transfer to the Casa Particular. After sunset, dare to explore the nightlife with live music and dancing. Overnight in Private House. Breakfast at the Private House. Today, take a city tour of this historic city centre, one of the most beautiful in Latin America and declared a World Heritage Site by UNESCO. Enjoy a stroll through the cobbled streets with majestic colonial buildings and visit the Romántico or Palacio Cantero museum. Free time to visit the craft market, where you have the opportunity to buy souvenirs. End the visit with a delicious cocktail in the popular Bar La Canchánchara. Then visit a pottery house to learn more about the manufacturing process. Lunch in a local restaurant. Afterwards, continue to explore the city on your own. Overnight in the Private House. Breakfast at the Private House. Free day at your leisure to explore the beaches of the Ancón peninsula 12 km away. The spectacular waters of the Caribbean Sea harbour accumulations of black coral on the seabed. Overnight the Private House. Breakfast at the Private House. Drive to Santa Clara for a short city tour in this emblematic city to visit the main attractions: the Mausoleum of Che Guevara and the Monument of the Armored Train (closed on Mondays). Lunch in a local restaurant. 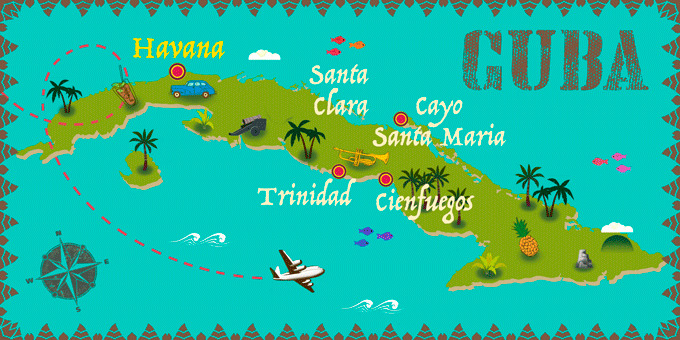 Before the onward journey to Cayo Santa Maria starts, you can explore the city on your own. Arrive in Cayo Santa Maria and check in to the hotel to begin your All-Inclusive stay. Overnight in Cayo Santa Maria. All-Inclusive. Free day, where we recommend taking a sightseeing tour to discover the special charm of this city and to visit Josone park, where you can take part in a wine tasting and enjoy drinks made from sugar cane juice. For those who want to get to know the Cuban culture, we recommend a visit to the nearby picturesque fishing village of Caibarién, where you can enjoy the slow pace of life in the country. Overnight in Cayo Santa Maria. All-Inclusive. We recommend taking advantage of the fabulous facilities at your hotel and enjoying the sunset cocktail on the beach. Overnight in Cayo Santa Maria. All-Inclusive. Continue to enjoy your tranquil stay. We recommend snorkelling in the crystal clear waters and admiring the flourishing marine life, or simply relaxing on the beach. Overnight in Cayo Santa Maria. Breakfast at the hotel. Transfer back to Havana and the Casa Particular and depending on your arrival time, enjoy some free time to discover one of the most beautiful and popular streets of the old town, Calle Obispo. Here you will find interesting shops, cafes and bars, but also hotels such as the Hotel Ambos Mundos, a favourite hotel of Hemingway, or the Hotel Floridita with its impressive lobby. Overnight in the Private House. Breakfast at the Private House. At the indicated time, transfer to the airport for your overnight flight back to the UK. Night on board. A visa is mandatory to enter the country. A visa is mandatory. This is issued at the consulate prior to travel. Electrical sockets are US-style with two flat pins .110V/60Hz. It is recommended to take out medical insurance. Flights are non-refundable and non-amendable. Remember to download your e-ticket to confirm the times of your flights and to complete online check-in using the airline's website, or directly at the check-in desk at the airport. Arrival at your UK departure airport for your flight to Cuba. Arrive and transfer to your Casa Particular. Casas Particulares are private family accommodations in Cuba that can be compared to a boarding house or bed and breakfast accommodation. In contrast to hotels, you can get to know the true Cuban life. Rest of the day free at your leisure. Start strolling the streets of Havana and enjoy the vibrant atmosphere of the capital. Overnight at the hotel. Breakfast at the hotel. Enjoy a panoramic tour of Havana. Discover the most emblematic sites of Havana, including the old colonial centre, which was the cradle of the Cuban revolution. Malecón de la Havana, which includes a wide avenue with skyscrapers contrasting with the country's colonial history, is the dynamic and modern district of Havana. The highlights of this region are the Revolution Square and Central Park. Overnight at the hotel. Breakfast at the hotel. Free day. Let yourself be charmed by this colonial city, its cobbled lanes, carved balconies and pastel-coloured facades. We recommend trying a plato ropa vieja as well as the emblematic mojitos and daiquiris. Overnight in the hotel. Breakfast at the hotel. Drive to Cienfuegos for a panoramic visit to the only Cuban city founded by the French to see Central Park, Tomás Terry Theater and Valley Plaza. Lunch is served in a local restaurant. Before the onward journey to Trinidad starts, you can briefly explore the city on your own. Arrive in Trinidad and transfer to the Casa Particular. After sunset, dare to explore the nightlife with live music and dancing. Overnight at Private House. Breakfast at the hotel. Transfer back to Havana and the Casa Particular and depending on your arrival time, enjoy some free time to discover one of the most beautiful and popular streets of the old town, Calle Obispo. Here you will find interesting shops, cafes and bars, but also hotels such as the Hotel Ambos Mundos, a favourite hotel of Hemingway, or the Hotel Floridita with its impressive lobby. Overnight in the hotel. Breakfast at the hote. At the indicated time, transfer to the airport for your overnight flight back to the UK. Night on board.